GUYANA’S President Bharrat Jagdeo has issued an SOS to Barbados and the rest of the Caribbean. Guyana needs doctors urgently he told the WEEKEND NATION, yesterday. 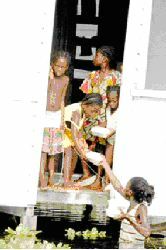 More than 120 000 people on the East Coast of Guyana remained under water siege yesterday for the 11th straight day. And authorities fear an outbreak of disease in these communities from the worst flooding in Guyana in over 100 years. Health officials have already identified signs of disease from the record flooding, with long lines of Guyanese being treated at a number of makeshift medical centres, set up along the heavily congested Demerara/Mahaica districts. Doctors heading medical teams were busy yesterday treating several hundred of those who had fallen to illnesses like skin disease, diarrhoea, influenza and the common cold. While floodwaters subsided in the capital Georgetown, several of the East Coast districts were still battling with water in some cases as much as seven feet deep. 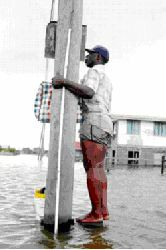 As floodwaters continue to inundate Guyana, residents of Buxton on the East Coast have fled their homes and taken to higher, drier ground. Temporary tent settlements such as this have sprung up along safe, higher roadsides, and like the biblical tale of Noah’s Ark, man and beast are living side by side in a desperate fight for survival. As unseasonal rains continue to drench the low-lying country, beleaguered Guyanese (like this man who was marooned on bricks in the middle of a street in Buxton for nearly two days) might be wondering if, as in the biblical tale, the rains will fall for 40 days and nights. UREGENT APPEAL FROM THE GCIFR, a non-governmental organization that has been focusing on current and long-term measures to alleviate the effects of the flood and its impact on the affected population. The GCIF has a working relationship with the Guyana government, non-governmental and international organizations as well as network with affected communities through their representatives. 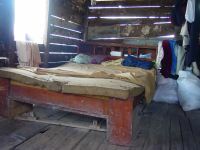 The Mattress Project of the Guyana Citizens Initiative for Flood Relief (GCIFR) began on Tuesday, February 22, 2005 after community groups, working with affected residents, identified mattresses as one of the items urgently needed. 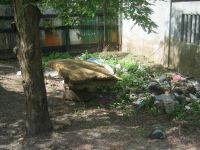 A fact-finding mission by members of the GCIFR found that many residents were either forced to discard their mattresses soaked with polluted flooded waters or at best wash and use them again.